On September 8, 1962, John H. Westervelt enlisted as a private into the 1st New York Volunteer Engineer Corps. That same year, he shipped out of New York on the "Star of the South" to South Carolina to fight for the North in the Civil War. The following April, he began a journal for his 13-year-old son Frazee so that his child could know of his experiences in the war. Sixty-two years later, John Westervelt's journal - 68 entries written on tattered, yellow pages, a record of "such things as may come under [his] personal observation" - was found in the trash outside his former home now West Farms. In early 1995, his drawings, meant to accompany the written journal, were discovered in the West Point Special Collections Archives. 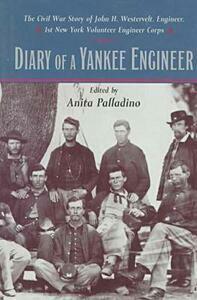 The two have been reunited in Diary of a Yankee Engineer. Westervelt's words, intended not for the history books but for the education of his young son, present a more humble vision of military life and of the North's struggle in the Civil War, than the often told sagas of glory. The journal gives us a rare look at the soldier's life of relentless tedium, the fatiguing fight of brother against brother - of pestilence and illness, giving us a "truer, if not beautiful" picture of war. This is the story of an ordinary man in an extraordinary time - a man who merely lived as he though right and who died in consequence. Anita Palladino's introduction provides us with a brief history of the man and the events of his life. By salvaging John Westervelt's journal and reuniting its text with its art, Ms. Palladino has unearthed a rare, firsthand look at the men behind the war of Rebellion.